We use a highly effective adjusting approach to help improve spinal biomechanics and reduce nervous interference (vertebral subluxation complex). The approach we use is safe and gentle, and based on our judgement and years of experience. The goal is not just to treat back pain and neck pain but to help you reach optimal function, increase energy and improve the quality of your life, naturally. The primary adjusting technique we use is called Diversified. Diversified technique has been used for over 90 years and includes an eclectic approach to the management of disorders of the spine and other joints in the body. The main premise is making the specific diagnosis of a spinal condition by using neurologic, orthopedic, chiropractic palpatory and radiographic examinations. There is also the understanding that the condition can be heavily influenced by things such as posture, walking patterns, developmental abnormalities and occupational and lifestyle factors. The chiropractic care we provide can be a combination of well established manual and non manual techniques. Depending on the patient and their underlying condition, we provide a customized approach to each individual. 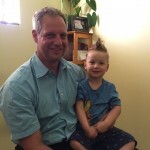 Dr. DiGiuseppe with one of our Chiro kids after a great adjustment.